Register To Vote With D4D + Opening Ceremony Today! The election is coming up and the deadline to register to vote in New York State is this Friday! 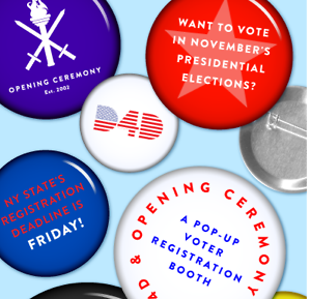 If you still need to register to vote, stop by Opening Ceremony's Soho store today and visit their pop-up voter registration booth. If you can't stop by in person tomorrow, fill out this voter registration form and send it PRONTO to your nearest Board of Election headquarters! Ballots need to be postmarked by Friday.